Three Class A state championships and seven regional titles in 14 years leave Hampden Academy as one of Maine’s top schoolboy basketball programs of the new century. With the backcourt tandem of senior Kory Winch and junior Bryce Lausier leading the way, rival coaches believe little may change this winter. Hampden, which finished 20-2 after falling by a single point to Greely of Cumberland Center in the 2018 Class A state final, must replace four-year starting center Ian McIntyre. Top threats to Hampden, according to a Class A North preseason coaches poll, are regional finalist Medomak Valley of Waldoboro and Cony, the only school to reach the North semifinals each of the last two years. Medomak Valley graduated only two players last June and returns plenty of contributors led by 6-foot-4 forward Gabe Allaire and guard Ryan Creamer, both seniors. Cony may have the division’s most dynamic player in 5-6 junior Simon McCormick, who spearheads a fast-paced offense and defense. Lawrence of Fairfield and Erskine Academy of South China will field senior-laden rosters, while Skowhegan has versatile senior Marcus Christopher and another 6-4 forward, junior Matush Prokop, to anchor the frontcourt. Brewer, a quarterfinalist last winter, has senior guard Brandon Glidden to lead a promising cast of underclassmen led by 6-0 sophomore Dylan Huff. The Class B season ended with undefeated Hermon holding the gold ball after a 55-34 victory over Wells in the state championship game. With junior forward Isaac Varney and senior guards Cody Hawes and Garrett Trask all returning to the starting lineup, coach Mark Reed’s Hawks loom as the team to beat again. MCI may be among the more serious challengers to the Hawks’ regional supremacy. The Pittsfield-based Huskies return two All-Kennebec Valley Athletic Conference honorees in junior guard Owen Williams and 6-7 senior Jose Ignacio “Nacho” Montes-Valverde, and they’ve added sophomore Gavin McArthur, a 6-2 transfer from Gardiner who should add some offensive punch once he fully recovers from a dislocated shoulder. Another top KVAC team in Class B North should be Oceanside of Rockland. Coach Matt Breen’s Mariners are led by 6-5 senior Cooper Wirkala, one of the region’s most versatile players. Mount Desert Island of Bar Harbor, the 2017 state champion, has consistently ranked near the top of the standings under coach Justin Norwood, and senior forwards Derek Collin and Andrew Shea should help the Trojans continue to contend. Caribou could emerge as a threat from The County under first-year head coach Kyle Corrigan, led by senior guard Austin Findlen and junior forward Parker Deprey. Orono, which earned the final preliminary-round berth last winter, should move up under new coach Ed Kohtala, the former University of Maine assistant and Bangor High School mentor. Connor Robertson, a 6-4 senior, is back after missing the end of last season with a knee injury. Sam Martin, a 6-6 junior, 6-3 sophomore Zach Dill and sophomore point guard Jason Desisto add to a young and talented nucleus. In Class C, George Stevens Academy of Blue Hill may not be as dominant as its three state-championship predecessors with Mr. Basketball finalist Taylor Schildroth and semifinalist Max Mattson among its most recent graduates. But the Eagles should remain among the top contenders for North region honors. Junior guard Caden Mattson, previously a defensive stopper, will add point-guard duties to his responsibilities while 6-3 senior Percy Zentz should be a prominent frontcourt presence for the Eagles. Other contenders are Mattanawcook Academy of Lincoln, Fort Kent, Houlton, Penobscot Valley of Howland, Central Aroostook of Mars Hill, Bucksport and Dexter. Mattanawcook returns three starters, led by All-Penobscot Valley Conference first-teamer Alex Brown, from a team that reached the “C” North semifinals. Other key players are center Cayden Spencer-Thompson and guard Nate Ring. Fort Kent also reached last February’s semifinals and has back 10 of its top 12 players from a year ago, including the inside-outside combo of senior forward Caleb Delisle and senior guard Cameron Jandreau among four returning starters. Leading Penobscot Valley are senior forwards Grant Kidon and Elijah Wood, both 2018 All-PVC selections. 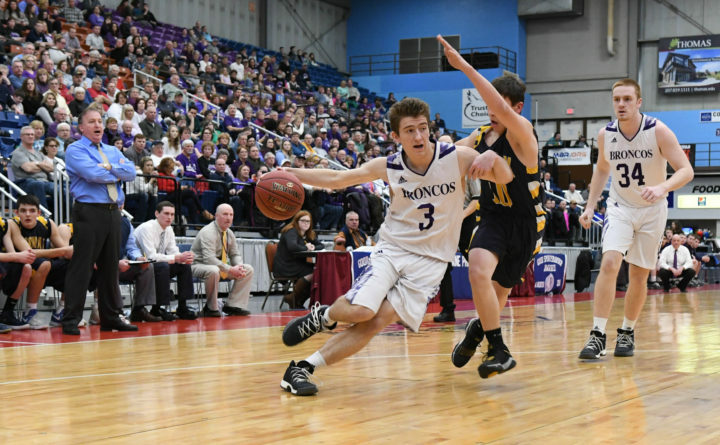 Junior guard Keegan Gentle and senior forward Nick Brewer are back to pace Houlton, while Central Aroostook returns senior guard Ben Thomas and junior forward Brayden Bradbury. Bucksport has first-team All-PVC senior forward Tyson Gray to lead a veteran nucleus, while Dexter will rely on its persistent defense to contend for a home playoff berth. The Class D North race begins with the teams that battled for the top spot last winter, defending champion Woodland and runner-up Jonesport-Beals. The Down East rivals split their regular-season meetings before Woodland edged Jonesport-Beals 40-37 in the regional final. Many key players are back, Woodland with all-tourney guard Drew Hayward, backcourt mate Chris Plissey and forwards Alex Morrison and Sabre Lee Phelps and Jonesport-Beals with guards Ryan Alley and Adam Robinson. Greater Houlton Christian Academy did not graduate a player from last winter’s 12-5 team and returns a formidable front line in seniors Isaac Potter and Cole Winslow and junior Parker Brewer. Schenck of East Millinocket will be battle-tested with 12 regular-season games against Class C opponents. Veterans Travis Thompson and Colby Hannon will lead the Wolverines, whose underclass contingent is led by sophomores Tyrone Davis and Isaac Adams.